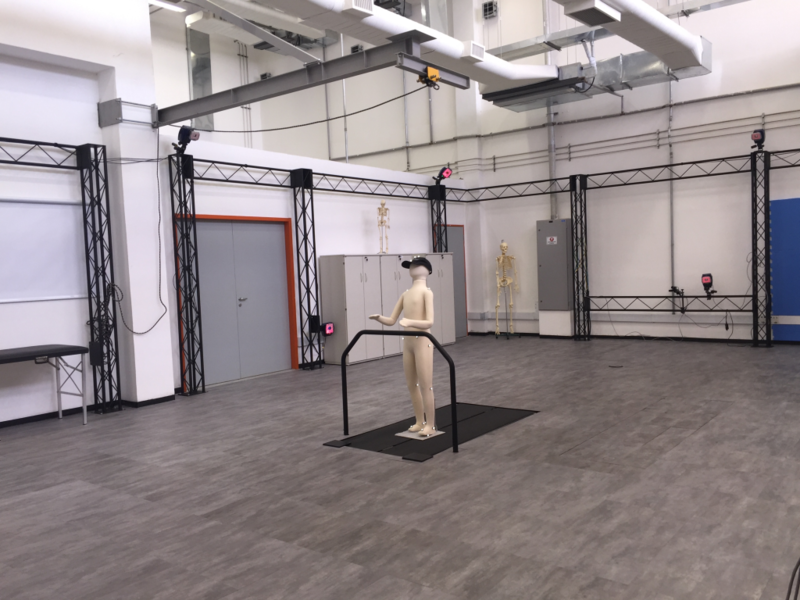 View of the BMClab room for movement analysis. System with 12 cameras with 4 Mb of resolution at 200 Hz, software and accessories (Raptor-4, Motion Analysis). Cortex manual. Two video cameras (scA640-120gc, Basler). Manual. Four video cameras (GR-DVL9800, JVC). Manual. Wireless EMG system with 10 sensors, software and accessories (Trigno Lab, Delsys). Manual. Portable mobile system with data logging and different transducers, software and accessories (EMG, EEG, acceleration, foot switch, load cell) (Trigno Mobile, Delsys). Manual. Oscilloscope (Tektronix), multimeter (Fluke), Function generator (CFG253, Tektronix).